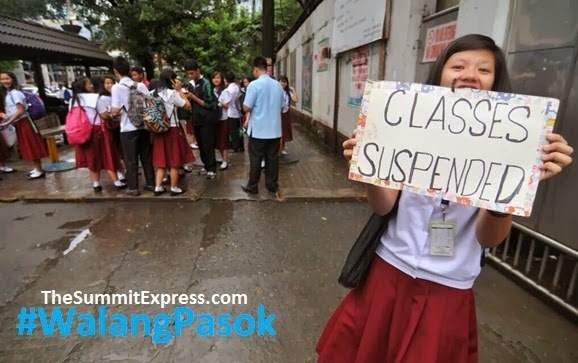 MANILA, Philippines - Local government units (LGUs) in Metro Manila and on nearby provinces announced class suspensions for tomorrow, July 10, 2015 (Friday) due to the effects of Typhoon 'Falcon' and Southwest Monsoon (Habagat) in the country. PAGASA on its 11:00am update today said that Typhoon Falcon has maintained its strength and begins to move in a northwest direction. Typhoon Falcon enhances the Southwest Monsoon that brings moderate to occasionally heavy rains over Luzon and Visayas especially over the western sections.